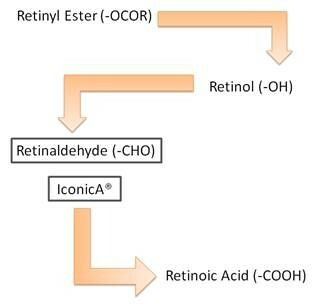 IconicA® was created as the first stable Retinaldehyde in the industry. Why is IconicA® iconic? Quite simply, we were told by a Retinoid expert that if the larger laboratories could never successfully stabilize Retinaldehyde’s strength, then it would be iconic if CoValence® was the first company in history to pull it off. Therefore, it was only natural that once our technology proved to create unmatched, beautiful results on the skin, while maintaining Retinaldehyde’s activity, we had to register the name for the active as: “IconicA®”. Vitamin A derivatives (Retinoids) have long been proven to generate stellar, anti-age benefits to skin. However, even though Retinoids are highly effective, they are also notoriously unstable…which is why most skincare companies formulate with a drop or two of a Retinoid, instead of its full, effective value. If you have known CoValence® for any length of time, you understand that we tend to ignore conventional wisdom and we formulate with the full, effective values of all Retinoids available to the skincare industry. However, we, as well as other labs, stayed clear of Retinaldehyde due to its level of instability, compared to the other Retinoids. Yet, we still longed to formulate an anti-aging product with Retinaldehyde because it is the ultimate Retinoid… it is the precursor to Retinoic Acid, which is the form of Vitamin A that is used by the human body, but at the same time Retinaldehyde has been proven to be the least irritating of all Vitamin A derivatives for topical use. In summary, why is IconicA® the best of all worlds in anti-age skincare? IconicA® performs closest to Retinoic Acid in a cosmetic topical, providing the ultimate anti-age properties to skin. IconicA® is the least irritating Vitamin A to skin, making it a perfect ingredient for all skin types. IconicA® is the first stable Retinaldehyde, offering the highest and most effective activity value to skin. IconicA® (national and international patents) can only be found through CoValence ®. IconicA® was developed with the cornerstone and most future-forward Retinoid technology available, the patented stabilized Retinaldehyde (aka: IconicA®). IconicA® performs closest to Retinoic Acid pharmaceutical grade products, without a prescription. IconicA® provides the ultimate bio-available Retinoid value that addresses wrinkles, hydration and skin aging prevention properties. IconicA® is comprised of the least irritating Vitamin A to skin, making it a perfect anti-age product for most skin types. IconicA® provides plant stem cell benefits that actively addresses and has shown to support natural skin rejuvenation turn-over, vastly improving the complexion of skin. Contact us for more information about purchasing our IconicA® in its pure powder form.